Based on the principle “anything can be a shoe”, ‘Footprint’, exhibition curated by shoe collectors Geert Bruloot and Eddy Michiels at MOMU in Antwerp shows the unbridled imagination and diversity of shoes in fashion. Address contributor Ezgi Toprak visited the exhibition. After rushing around Antwerp in my high-heels on a cold rainy day in autumn, I spontaneously decided to visit MoMu. 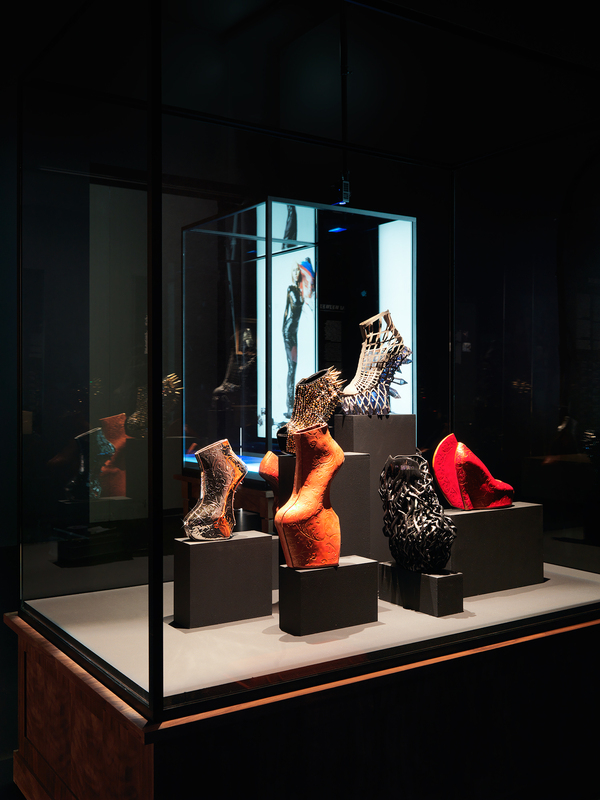 Having attended the previous exhibition based on fashion designer Dries van Noten’s work, I entered the museum without preconception of what to expect from the new exhibition Footprint – The Track of Shoes in Fashion, on display until 14th February 2016 . Upon stepping into the space, my feminine instincts took over, quickly followed by my anthropologist inquisitiveness. What makes an everyday object like shoes worth an elaborate display like this? It could be easy to assume that the exhibition is all about adorable footwear, however the focal point is not just the shoes but the social story around feet, that have left an elegant mark in the history of fashion and culture. The very first thing visitors encounter is not a shoe, but a black and white film clip ‘the dance of the bread rolls’, from Charlie Chaplin’s film Gold Rush made in 1925. Across the room, the creations of the surrealist collaboration between Elsa Schiaparelli and Salvador Dali accompanied by the famous shoe-hat. Each of showcase in the exhibition have been immaculately prepared like a page from a tale, their contents thoroughly researched and companied by rich visualisations. Like metaphorical doors, they lead the viewer into different stories with images, movie scenes and songs hoping to ignite the visitor’s curiosity to consider the relationship between the foot and the shoe. 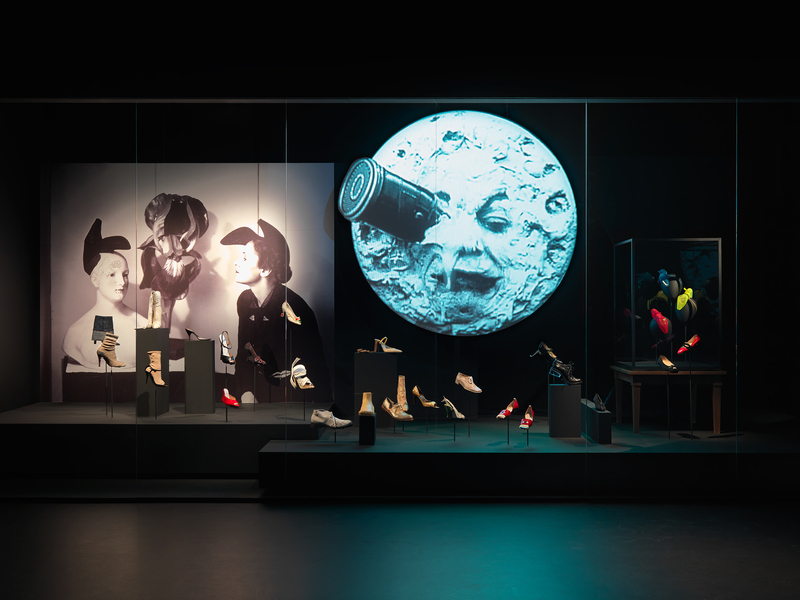 Themes such as architecture, pop, utopia, tribalism and sabotage bring focus to the way in which the exhibition has been curated whilst simultaneously tracing the evolution of shoe design throughout the history. One of the theme titled Space Age takes the viewer back to Stanley Kubrick’s The Space Oddyssey (1968). Transparent, metal and silver detailing are typical for this style with examples from designers such as Paco Rabanne and Thierry Mugler. What Ever Happened to Baby Jane? (1962) with glamorous Bette Davis acts as another filmic reference point. A close-up scene where Davis steps on the gas pedal immortalizes the shoes she is wearing. 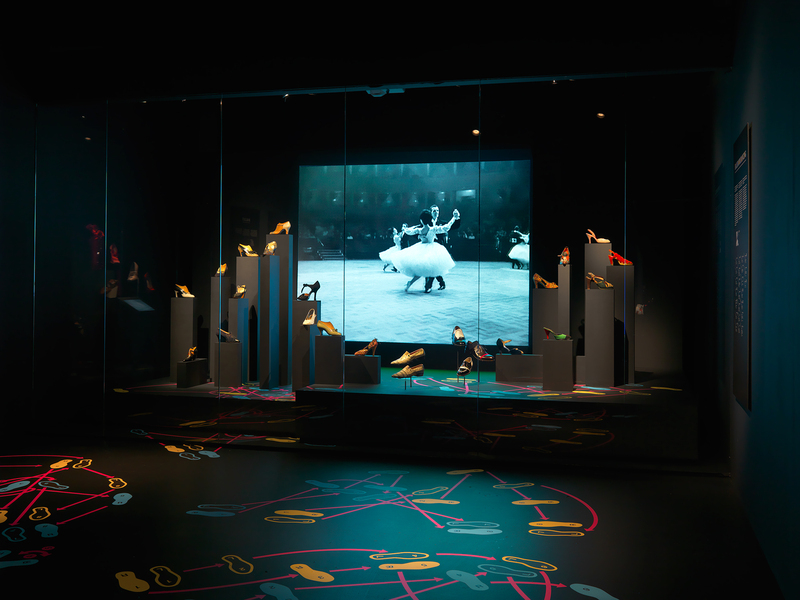 The largest part of the exhibition is devoted to Salvatore Ferragamo’s shoe archive with shoes created for actresses such as Marilyn Monroe and Elizabeth Taylor. There is large section devoted to dance shoes also. The high-heel ballet shoes symbolises the nature of the discipline with equal measure of pain and elegance. Ballroom dance shoes from Fred and Ginger movies transition into street dance with references to hip-hop, break dance and skater boys. Limited-edition sneakers from designers such as Giuseppe Zanotti, Raf Simons and Rick Owens have also been included as an example of how street and high fashion collide. Themes of glamour, power and sexuality are also largely explored in the exhibition. High-heel shoes, seductive as power tools require physical sacrifice to symbolise strong femininity. Nothing quite captures this like Christian Louboutin’s fetishistic red-soled shoes. Seductiveness of heels accompanied with Baroque inspirations by the provocative punk designer Vivienne Westwood, the 23cm high platform shoes that made Naomi Campbell fall during the 1993 catwalk show were also there.“Shoes must have high-heel platforms to put a woman’s beauty on a pedestal” Westwood notes. Sexuality, tradition and masculinity are portrayed with Mexican pointy boots. These boots, an exaggerated version of Aladdin’s slippers, can be up to 90cm above the ground thereby symbolizing the male wearer’s social and sexual status in Mexican culture. For this reason, the higher is of course better! The exhibition is captivating with multiple simultaneous narratives rooted in rich context. It acts as a three-dimensional novel with parts that needs revisiting in order to appreciate the layers embedded in the different tableaus around the exhibition. Finishing the exhibition evokes that very same feeling of contentment to finishing a fantastic book. However, it’s a journey not to be travelled in high heels but with something comfortable that allows you to linger learn the story around shoes.